A man’s best friend has 4 legs, 2 adorable eyes & a big old heart. It is no secret that Czechs absolutely adore dogs. This affection manifests itself in the many doggy-friendly places, parks and playgrounds. This guide will tell you all about living in the Czech capital with your furry friend; so you two can make the most of your stay! One thing’s for sure: Czech people absolutely adore dogs. And because they have a big heart for the quadruplets, Prague might just be one the best capital cities to have a dog in. Not only are Czechs fond of dogs; they also train their own doggies extremely well. In the past years, the amount of dogs in the Czech Republic has massively grown and was at 2.15 million furry fellas in the country by 2017. Let there be free roaming! Or at least proper walks. The green city of Prague is home to over 100 parks, where your quadruplet can do his or her business, roam and run. While you will have to keep them on a leash in most parks, there are some exceptions, where the leash can come off and even some designated meadows for dogs only exist. Not just a good view is what the park overlooking Old Town has to offer. 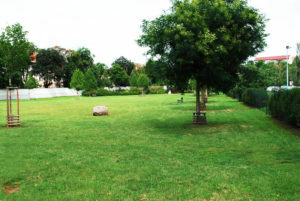 This widespread green area offers loads of space to roam, play and roll around leash-free. Between the Letna Palace and Kostelni street lies the hidden doggie area, where your best friend can roam free. Prague 8 must be a dog’s heaven. Currently ten green areas for dogs can be found. One of them in U Meteora, another green space in the park Frantiska Kadlece – which is even fenced in and has a few obstacles to run over. Further south in Karlin, doggies can roam freely on the green space on Invalidovna. Find all of the ten parks in Prague 8 on the homepage of Prague 8. Next to the waterworks of Podoli, dogs have their very own playground. It is packed with 10 obstacles that not only demand physical fitness but will also test your companion’s obedience. Another off-leash area for doggies is located on Václava Sedláčka, Modřany. Two very lovely spots for doggies are located in Prague 9 and 10. In the crossing of V Chaloupkách and Hloubětínská you will find a meadow that is fenced in and has 7 obstacles made out of metal and nonslip rubber. 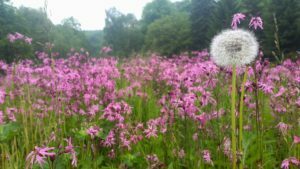 Dog owners travelling to Malešice have two options: Either the meadow on Uvalska (the garden city) and near the Vršovice train station. Find all parks in Prague 9 and 10 here. If you are not sure where your dog can roam freely, check out the website of “Hafbezobav”, where you can find areas that ask for a leash around your dog’s neck. A common question: Am I required to have my dog on a leash at all times? No, you don’t. 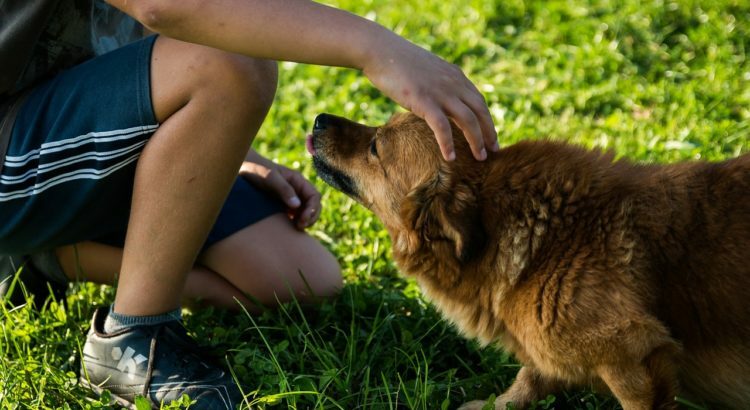 According to the Prague City Police, owners decide themselves, whether their dog might be a threat to others and if it requires to be held on a leash or not. Bear in mind that owners are responsible for attacks or damages a dog creates. That said, there are certain areas, where a dog has to be on a leash. Funnily enough, leashes are a necessity in most parks in Prague, as well as – understandably so – on public transport. 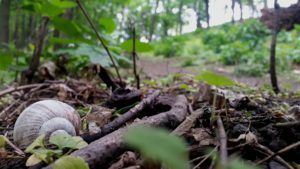 Generally speaking: Trust your gut and look out for signs indicating that your dog should be on a leash. 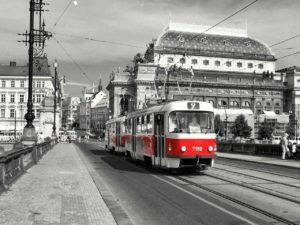 In Prague – being one of the dog-friendliest cities – you can bring your dog onto trams, buses and trains. Make sure they are on a leash or in a doggy carry bag during the ride. Prague’s Tram Regulations furthermore demand, that the doggie is muzzled, in order to prevent accidents. Doggies also get to enter via designated doors and should not be placed near baby carriers. While in other countries, doggies usually have to wait outside when their owner is munching on something yummy, in Czech Republic almost every restaurant, bar and even cinemas are dog-friendly. Don’t be surprised if the waiters and employees of the place will want to pet your furry friend. That said, they will usually not do so without asking, which brings us to the next point. 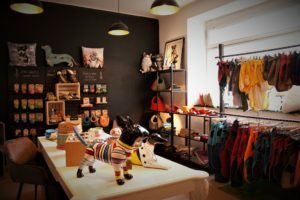 We absolutely love this Zero Waste doggie store in Prague 6! Besides cool and locally produced leashes, doggie coats and toys, DOGG also offers package free food, treats and more. Their staff is very nice, speaks English and of course: Have their doggies roam the shop. Shopping for a Beco Toy or a more sophisticated gadget like the GPS tracker is an absolute delight in the cute, little shop off Tusarova tram stop. Prague offers space for many activities with your quadruplet. 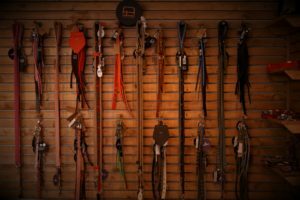 If you are still looking for the right hobby to undertake with your dog, maybe one of these will be just what you two were looking for. What used to be (and still is) a job for police and rescue dogs, your furry friend can learn, too! A fun and demanding hobby for dogs is Man trailing. The term itself is self-explaining. By giving the dog a piece of clothing or alike, the quadruplet gets a whiff and searches for missing people and objects. This is a great excercise for doggies that need a bit of a mental challenge, too. Start off by taking his favourite toy with you. Let him sniff the toy, then proceed to hide it in a bush, behind a rock or in high grass. Give the order “Search!” and treat your friend with either a treat or an enthusiastic “Well done!” and a pet, if he retrieves the object. You can differentiate the complexity of this, until eventually your dog is able to find you. Your dog is a power bundle and needs a lot of running around? 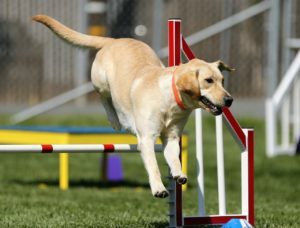 Then agility might just be the thing for your dog to spend his time with. You can either join Dogpoint for courses and go practice in a special training hall or just visit one of the parks mentioned above that offer obstacle courses. By the way: Dogpoint also offers yoga courses for the canines that want to try out something new. For all the puppies that need to learn how to behave and how to listen to their owner, Prague offers a variety of Obedience Schools. Psitrenink.cz focuses on courses that are fun while ensuring that participants learn thouroughly. The best way to learn is – after all – by having fun, right? If you are a working dog owner and need a place for your furry friend to play and roam free in the city, Happy Dog might be the perfect place for that. A little further out the city, in Modřany and Dolní Počernice, a quadruplet can spend his or her time with other fellows and roam free. They also have a Kindergarten for doggies, where they can socialize and slowly develop their skills amongst other noses. About two dozens of dogs attend the kindergarten daily, having a living room, a yard and spacious garden at their disposal. On sunny days, the class even gets to do excursions to the nearby meadow, the woods or to obstacle courses. They also offer grooming services and have doggie goods to sell in their shop. What is best: They offer a doggie cab to and from the daycare. Something no owner or dog lover wants to think of, but unfortunately has to, are vets. Whether it is for vaccinations or a treatment, knowing where you can turn to if your doggy needs medical assistance is a must. If you adopted a puppy in the Republic, they will usually have a vet that they are already accustomed to and that he trusts. 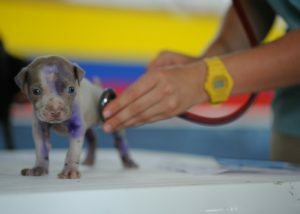 If, however, you moved with a puppy, finding a vet in your proximity is a high priority. This list might help you find the right doctor for your pet – just in case. Roaming, playing and rolling in the dirt are all fun and good; but let´s not forget about furcare! 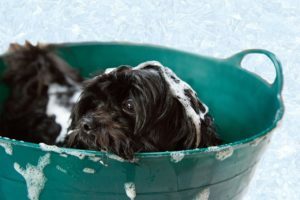 Especially long-haired dogs need a lot of attention and paws, claws and co. of any furry friend should be checked and maintained on a regular basis. 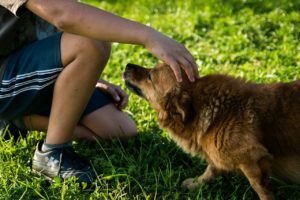 If you find yourself not having sufficient time to tend to the extensive care a dog might need, several places around the city will gladly help you out. This allround-groomer will take care of any breed, any kind of care and is specialized in furcare. Whether your doggie needs a trim, a wash or pawcare, the team of Salon Fido got you covered. They are conveniently located in Prague 3 and are easy to get to with public transport. Salon Anjuli is one of the biggest and best equipped groomers in the city and have 20 years of experience in grooming doggies. Anjuli works with natural shampoos, oils and other care products and even offer courses on how to groom your dog yourself! Located in Nusle, Prague 4, Salon Anjuli offers the usual services such as trimming, brushing, washing, pawcare and more. Do it yourself, with a big tub! Metro Dogs is perfect for all the dog owners that can take care of their dog’s fur by themselves but lack the right size of bathtub at home. Prizes for the machines start at CZK 30.00 and has different ‘cycles’ to choose from. The easy and quick washing station is located in Prague 8. How are you and your furry friend spending your time in Prague? Do you have favourite dog parks to share or stores you like to frequent? We would love to hear all about it in the comments!